Who Were the Kiev Snipers? The snipers who shot at protesters and police in Kiev were allegedly hired by Maidan leaders, according to a leaked phone conversation which emerged online. (PORTLAND) - This leaked 11-minute phone conversation of Feb 25, confirmed by the Estonian foreign ministry, is not getting the attention in the western media that the leaked phone call between Victoria Nuland and the US ambassador in Kiev got. Ashton refuses to comment so far. It’s also worth noting that in that previous leaked call, Nuland bragged how former U.S. (now UN official) Jeffrey Feltman "got" UN Secretary General Ban Ki-moon to send Dutch diplomat Robert Serry to Ukraine. Serry is the one the western media is shocked to report he just got kicked out of the Crimea. Finally, check out Clinton’s use of the “Hitler comparison” against Putin—it’s all over the media. She’s some diplomat, some Dem presidential candidate! “There is now stronger and stronger understanding that behind the snipers, it was not Yanukovich, but it was somebody from the new coalition,” Estonian foreign minister Urmas Paet tells EU foreign relations chief Catherine Ashton said during the conversation. The call took place after Paet visited Kiev on February 25, following the peak of clashes between the pro-EU protesters and security forces in the Ukrainian capital. Paet also recalled his conversation with Olga Bogomolets, a doctor who treated those shot by snipers in Kiev. The doctor said that both protesters and police were shot at by the same people. “And second, what was quite disturbing, this same Olga told as well that all the evidence shows that the people who were killed by snipers from both sides, among policemen and then people from the streets, that they were the same snipers killing people from both sides,” the Estonian FM stressed. The Estonian FM has described the whole sniper issue as “disturbing” and added, “it already discredits from the very beginning” the new Ukrainian power. His overall impressions of what he saw during his one-day trip to Kiev are “sad,” Paet said during the conversation. 94 people were killed and another 900 injured during the standoff between police and protesters at Maidan Square in Kiev last month. 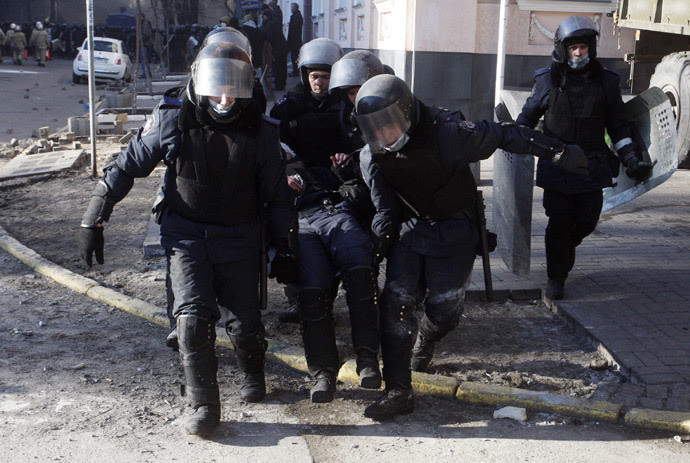 Policemen carry a colleague wounded during clashes with anti-government protesters in Kiev on February 18, 2014. Why is this story not being picked up by the mainstream media!? Because it doesn't benefit the corporate or military structure? Hard to say, thanks for your comment.